The LIU Brooklyn campus in Downtown Brooklyn. DOWNTOWN BROOKLYN — Faculty members at Long Island University’s campus will be locked out of the school starting Friday night after their contract with the university expired — as the school plans to borrow staff from other campuses to teach upcoming classes, the union says. Starting at midnight, unionized members of the LIU Faculty Federation (LIUFF) won’t be allowed on campus after the university refused to accept terms of a new contract that would have increased pay to match that of their Long Island colleagues. 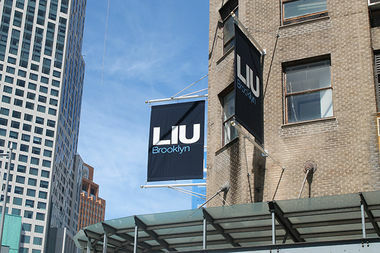 When classes start on Sept. 7, staff members from LIU's Brooklyn campus and Post campus on Long Island will be taking over classes for full-time and part-time faculty members, according to LIUFF Vice President Ralph Engelman. Engelman, who’s also a journalism professor at the university, said mid-level staff members, many of whom have no teaching qualifications, will be covering the classes. “This is the first time that the administration went to great lengths to have our classes covered mostly by staff, people who in many instances are unqualified to teach,” he said. The lockout follows a series of failed contract negotiations that started in April between LIU's administration and the union. Faculty members lost their salaries and health benefits Wednesday, when the five-year contract officially expired. The minimum salary for new professors at LIU Post is $96,000, while the minimum salary for new professors at LIU Brooklyn under the administration’s proposal would be just $80,000, according to Engelman. Faculty at LIU Brooklyn are also asking to remove post-tenure review from the contract, which would allow the administration to reconsider a professor’s tenure status, a clause that isn’t in the LIU Post contract, Engelman explained. “We feel that they’re favoring their suburban campus where most of the board of trustees live,” he said. A spokeswoman for LIU did not respond to a request for comment. Local and state officials sent a letter to LIU President Kimberly Cline earlier this month backing union members and asking the administration to raise the minimum salary for LIU Brooklyn's faculty. “Equity for all workers who service the LIU community, no matter on which campus, is essential to the development of the university and sets the highest example of salary parity for our students,” said the Aug. 11 letter signed by Public Advocate Letitia James, Borough President Eric Adams, Councilwoman Laurie Cumbo and other elected officials. Elected officials also asked the university to reach agreements with four other unions — representing secretaries and staff members, carpenters, engineers and building maintenance workers, and janitorial staff — that have been working without contracts since 2012. Another round of contract negotiations is set for next Thursday. Faculty members plan to protest the lockout on the first day of classes at 10 a.m. Wednesday outside the Brooklyn campus, at Flatbush and DeKalb avenues.